We were delighted to host the 2017 WEG Annual Conference at the Scarman House, The University of Warwick and announce the winners of the WEG Awards. Our 3rd annual conference brought the team together to celebrate a series of milestones for a number of our brands, including the successful launch of new Unitemps franchises at Middlesex University, Salford University, La Trobe University, and Nottingham Trent University, establishing our base office in Brisbane, and continued growth of our jobs.ac.uk, college.jobs.ac.uk and SearchHigher. In 2017, the Compliance team had a busy year with the introduction of pensions auto enrolment and continuing to offer training and support for Unitemps franchises, but also saw a record breaking month in October enrolling new starters at Unitemps. The Unitemps Warwick branch saw the number of candidates increase from the previous year, as well as an increase in the number of jobs available. SearchHigher enjoyed the success of appointing a series of high-profile roles and advising some of the world’s most prestigious universities across a range of disciplines, while jobs.ac.uk underwent an improvement project in collaboration with the IT and Marketing teams that will continue into 2018 to improve the functionality of the website and expand upon its record website sessions. college.jobs.ac.uk worked with 200 UK FE colleges in 2017 to meet the needs of the sector and the thousands of jobseekers who are searching for roles each month. 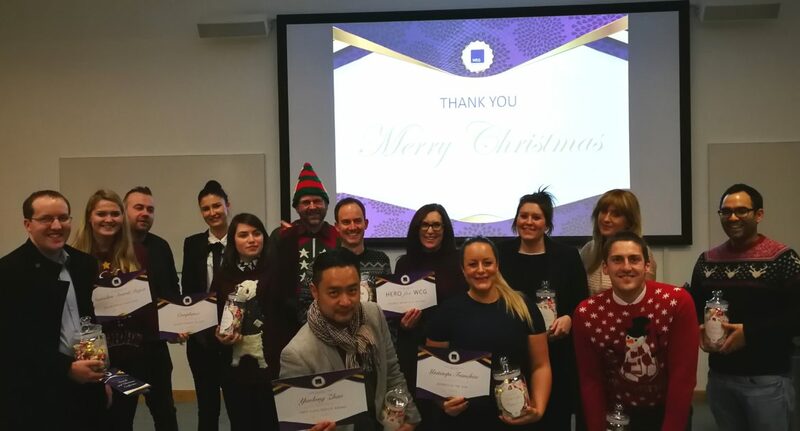 The conference was a fantastic opportunity to recognise the achievements of WEG staff and celebrate the start of the holiday season at our Christmas meal. We look forward to going from strength to strength in 2018 as we continue to grow.